Sign up NewsletterWe are delighted to announce we have launched an all-new website that is clearer, easier to navigate, and now includes an online shop for SATECH modular perimeter machine guarding components. Useful resources such as drawings, data sheets, machinery safety guides are all available for free download. 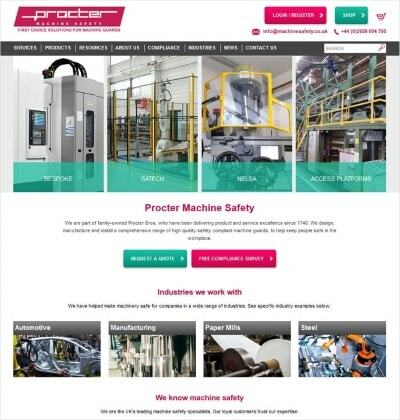 To coincide with the new website and to reflect the wider range of machinery safety services now offered, Procter Machine Guarding has rebranded as Procter Machine Safety. To help our modular guarding customers place orders quickly online, we have also invested in a new e-commerce facility so customers can purchase components from our popular SATECH BASIC modular perimeter guarding system. Products that can be bought online include posts in a choice of heights, a wide variety of mesh panels, and door kits and accessories. We hope you find our new website useful and informative. To ensure this website meets your needs, please let us know if you have any feedback or suggestions at [email protected].